Rapper Drake poses in a Johnny Manziel jersey. The bromance between Johnny Manziel and rapper Drake continues to blossom. Saturday, Drake posted a couple photos on his Instagram account with him and some friends wearing long-sleeved Manziel jerseys. 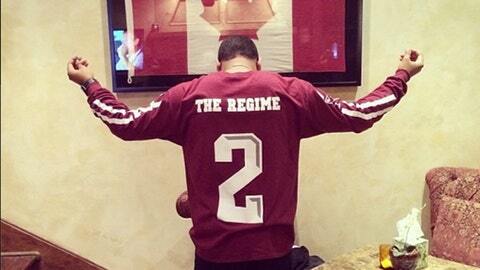 In another photo, Drake turns around to reveal the back of the jersey with the words "The Regime" printed in the name block. This comes one day after Manziel posted a shoutout to the rapper on his Instagram account with a photo of him doing the the regime hand sign on the football field this past season. The Regime is in reference to Topszn Regime (apparently pronounced ‘top season regime’), which means something to Drake and his crew. One theory has it referencing a strand of marijuana. It seems Manziel is inching his way closer into Drake’s inner circle if he isn’t there already. Manziel has been public about his admiration of the rapper. In the fall, the Heisman-winning quarterback debuted an OVO tattoo, which was in reference to "October’s Very Own," the name of Drake’s record label, and also stated that hanging out with the rapper was the highlight of his offseason. Drake also showed Manziel some love during the season by posting a photo of him watching a Texas A&M game wearing a Manziel jersey. Could a collaboration be next? It might be fun(ny) listening to Johnny Rapper, though that name doesn’t have as nice of a ring to it as Johnny Football.